Liz and Matt Achieve CC Award! 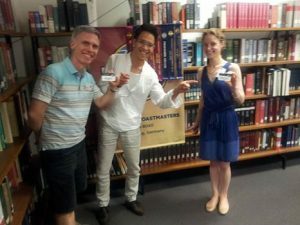 An evening of achievements and milestones at Nuremberg Toastmasters! In our 200th meeting on 19 June 2017, Marc relived his Toastmasters journey, from nervous beginnings to contest winner. Matt urged us to carefully consider the true cost of all the “things” we buy – we pay not just with money but also with our time and emotions. And Liz took us back to the special times of “Hotel Grandma” and encouraged us to actively love in return to those that show love to us. At the end of the evening, both Matt and Liz received their Competent Communicator awards from Acting President Phuc-An, a significant milestone in recognition of their 10th Toastmasters speech. Congrats, Liz and Matt! This entry was posted in Club Meetings, Competent Communicator and tagged Competent Communicator, Liz, Matthew. Bookmark the permalink.